Homes along Union Street near the corner of Hudson Street in Bangor. The area is part of Bangor’s Whitney Park neighborhood. 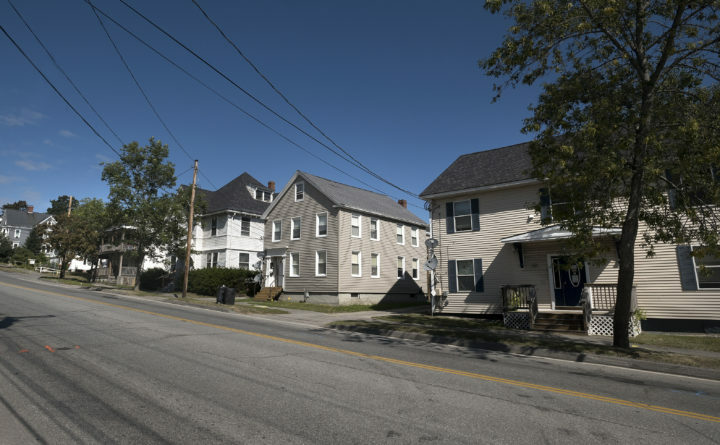 The Bangor Daily News’ look into housing affordability in the Queen City began with a simple enough data point from MaineHousing: Rent in Bangor became less affordable than Portland last year. There’s a lot behind the data that generates MaineHousing’s affordability index, where a ranking of 1 or more means housing is affordable in the area. The index compares median incomes in an area to the median two-bedroom rent for the year. Every data source behind that index and other parts of our analysis has strengths and weaknesses — blind spots that leave us, at times, with only partial answers. For instance, demographers can say with 95 percent certainty that there are between 380 and 740 households in the Capehart neighborhood where renters are paying more than they should. That’s a wide range, which comes from the fact that the estimates are based on household surveys conducted in those areas between 2012 and 2016. The surveys are then extrapolated to the entire population in that area. There are sometimes wide margins of error — which we’ve presented along with our data — but it’s the best publicly available information about rental affordability at that local level, and it formed an important part of our story. Household survey data is also the basis for estimates that show the median income has dropped for Bangor renters. That estimate is produced for MaineHousing by the consulting firm Claritas, which uses estimates from those census surveys as a base to project what that median income is at the local level in a single given year, according to Richard Taylor, MaineHousing’s research manager. To find out more about what’s happening with wages at the local level, we turned to the most comprehensive set of local economic data available, from the Quarterly Census of Employment and Wages. The information comes from actual employer records submitted through the unemployment insurance system, so it provides better detail than surveys. But it, too, has some weaknesses in answering what’s going on with household pay locally. For one, it’s not based on where people live but where they work. For answering questions about how people are affording housing, that has an obvious limitation. It also deals in average weekly wages and annual pay for all jobs in a given industry, not hourly wages. That leaves no distinction between full-, part-time or seasonal work. With those limitations in mind, the data do indicate broader economic trends and changes in the jobs that are most available to Bangor residents, at a local level of detail that’s not available from other sources. Similarly, a new set of data from The Eviction Lab at Princeton University gives a very local picture of evictions, at the same level as the survey-based estimates of income and rental costs from the census bureau. None of that data can answer every question about housing affordability in Bangor — for instance, census data on housing quality at the neighborhood level has such great margins of error that it’s of very limited use. But together, the data provides different perspectives on what’s happening in the local economy and housing market that appears to be putting more pressure on Bangor renters.